My bicycle made it! I did too! On July 22nd, I reached St. John's, Newfoundland. (You can click on this and other pictures on this web site to get a full-sized image, ~60k). These pages have been set up to document my summer 1997 bicycle trip across Canada. 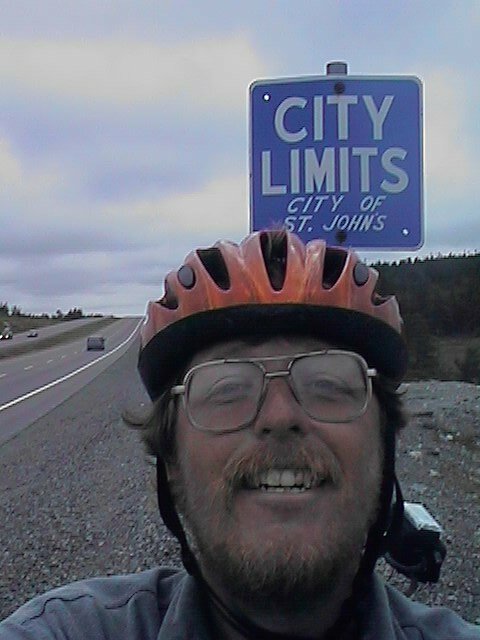 I started in Fairbanks, Alaska and cycled 6089 miles to St. John's Newfoundland. I came across all ten Canadian provinces and also the Yukon Territory. The route included the Alaska Highway through Alaska and BC; the Yellowhead Highway across the prairies; Trans-Canada Highway across northern Ontario; along the St. Lawrence in southern Ontario and Quebec; around the Gulf of St. Lawrence in the Maritimes and finally the Trans-Canada Highway across Newfoundland.